No one goes into ministry planning to fail. Yet, many who start out with the noblest intentions can become overwhelmed by the demands they encounter. Apostle Frederick K.C. Price knows the challenges, and has assembled an exceptional resource for pastors and ministry leaders. In this book he shares time-tested wisdom gleaned from more than 60 years in ministry. In addition to foundational teachings, there is an expanded Appendix, in which Apostle Price offers thoughtful, biblical answers to questions he's frequently gotten on topics such as prayer, spiritual and physical discipline, the pastor's salary, balancing family and ministry, and maintaining order in services, among others. His responses, delivered in his engaging signature style make this book the next best thing to having an intimate talk with the iconic leader face-to-face. 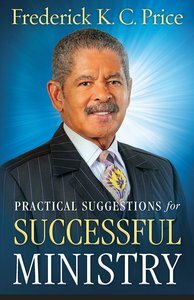 About "Practical Suggestions For Successful Ministry"
Frederick K. C. Price founded Crenshaw Christian Center (CCC) in Inglewood, California, which is now the home of the FaithDome, with a church membership of over 22,000. He also founded the Fellowship of Inner City Word of Faith Ministries (FICWFM) in 1990. In addition to pastoring, he is the author of some 50 books on faith, healing, prosperity, and the Holy Spirit and has sold more than 2.1 million books since 1976.